Only eight days after the German government issued a terror alert for all its domestic airports (see our related coverage), the Hannover airport (northern part of Germany) was closed for several hours after a man rammed a gate, drove his car onto the tarmac and chased a plane. Air traffic at Hanover's airport was shut down for hours after a man said to be under the influence of drugs, drove a car with Polish number plate onto the tarmac. Panic broke out in the terminal when onlookers saw what happened. Late in the evening flights resumed again. Police ensured everyone that the man had no terrorist motives but was merely under the influence of drugs. The man rammed a gate shortly before 4 o'clock with his car (said to be a BMW) and then drove up the tarmac where he was eventually stopped. As a precaution, all air traffic was halted. Part of terminal A was shut down and several flights were delayed. The other two terminals remained open but all air traffic was ordered to stay either in the air or on the ground. Some twenty flights with destination Hannover were diverted to nearby airports. Around half past eight in the evening preparations were made to restart air traffic. Related coverage: Germany – Terror Alert In All Airports. The man has been arrested. He tested positive for the use of cocaine and amphetamine. His motive is not known, but the police do not indicate that it has anything to do with terror. The police searched his car with a Polish number plate. No weapons were found in the car. 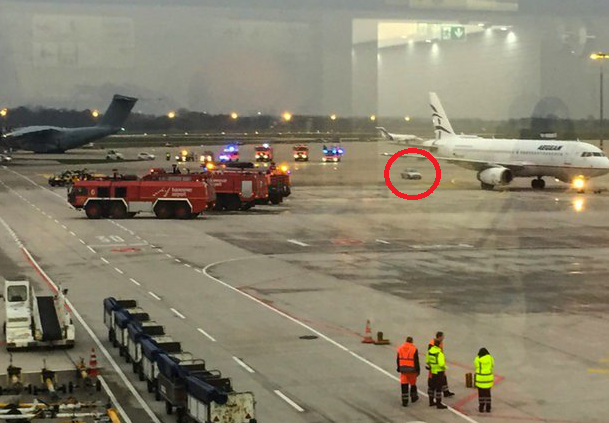 According to German media, the man would have tried to drive behind an airplane that had just landed. It was an airplane of Greek company Aegean Airlines. The security measures at Hanover Airport had been tightened shortly before Christmas after the German intelligence services had indicated that there was a plan by Islamic extremists to commit an attack. A father and his son, both known to intelligence services for sympathy to Islamic extremism, had been seen both at Stuttgart airport in Germany and Charles De Gaulle Paris airport in France taking pictures of the terminals.